Rose Quartz is a gentle pink with soothing appeal. The delicately colored like-named gemstone, a variety of quartz, is said to be the stone of unconditional love. Feel confident wearing jewelry designed with the durable gem every day. Buttercup is a warm, cheerful yellow that brings fancy yellow diamonds (the most popular colored diamond) to mind. Captivating color is just one of the many attributes of fancy yellows, which present an attention-getting alternative to a white diamond engagement ring! Fiesta is a vivid and fiery yellow-based red, similar to red coral, a stone reported to represent passion. The gem is distinguished by its intense color and durability. Green Flash resembles restful yellow-green peridot, the birthstone for August. The gemstone, found in meteorites, is suitable in every type of jewelry. Iced Coffee is a subtle earth tone. Consider smoky or whiskey quartz, brown diamonds, tiger iron, chocolate brown pearls and smoky topaz among its gemstone counterparts. 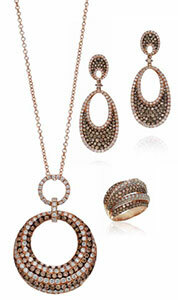 These neutrals are a natural for your wardrobe – fashion and jewelry! Lilac Grey is, as its name implies, a neutral with lilac undertones. This basic is a classic with a twist and evokes a blend of cool, neutral gray pearls and amethyst, the most valued quartz variety, available in shades of purple, lilac and mauve. Clean, fresh Limpet Shell is a tranquil shade that is reminiscent of aquamarine, the birthstone for March. Crisp and modern, the gem, dubbed “Water of the Sea,” is like a breath of springtime every time you wear it! Peach Echo is a friendly-looking tone in the orange family that evokes feelings of warmth and openness. Its gem complement is the highly prized imperial topaz, which has a golden color enhanced by reddish and orange overtones, like a sunset. Serenity is an airy pale blue with a palpable calming effect, like that of sky blue topaz. The color of calm and quiet, it is December’s birthstone, suitable in virtually any type of jewelry. The maritime-inspired Snorkel Blue is as energetic as lapis lazuli. The beautiful rock is treasured for its bright blue color. Hailed as a stone of friendship and truth, its fabulous color is fascinating to men and women alike. The great news about these gemstones is their ability to work across colors in unexpected combinations. Mix and match pieces to express yourself and make a colorful statement day or night. Get ready to launch your seasonal look with a new piece (or two!) of gemstone jewelry! As you have read, every color of the rainbow is available…and then some! Colors speak volumes, and gemstones have played a role in myths and legends throughout history. They are beautiful, therapeutic and rich in symbolism.